2019: NOT JUST ANOTHER ‘BOARING’ YEAR! Here’s your chance to SOAR in the year of the boar! • Be the FIRST to hear all out about the overall outlook of 2019. • Identify which WHO will thrive (or suffer) and how YOU can make the best out of the current economic situation. • Learn about the overall forecast for 2019 based on all 12 animal signs. • Learn how this impacts YOU personally based on your personal date and time of birth. • Participate in focused and personalised sessions based on YOUR individual Bazi, learn exactly what to expect and look out for in 2019, and how you can maximize both your professional and personal potential. • Know what YOUR best sectors for wealth, health and relationships are, and how you can directly benefit from them. • Practice the dos and don’ts when it comes to Feng Shui and enjoy visible and more positive results in every aspect of your life. • Learn how to improve your personal and professional relationships in the workplace or your respective industries. • Learn to identify the best and most effective dates for receiving the God of Wealth and the God of Noblemen plus the auspicious dates after Chinese New Year that is most suitable for you to resume work to ensure a smooth year ahead. • It is no secret that power dates have long been instrumental to the successes of both important personal or professional events. From global organisations selecting the most auspicious dates for their product launches and corporate events to families and individuals seeking out dates that will best work for their weddings, moving into new homes and more – all these successes can be affected by one simple act of choosing the right power dates! 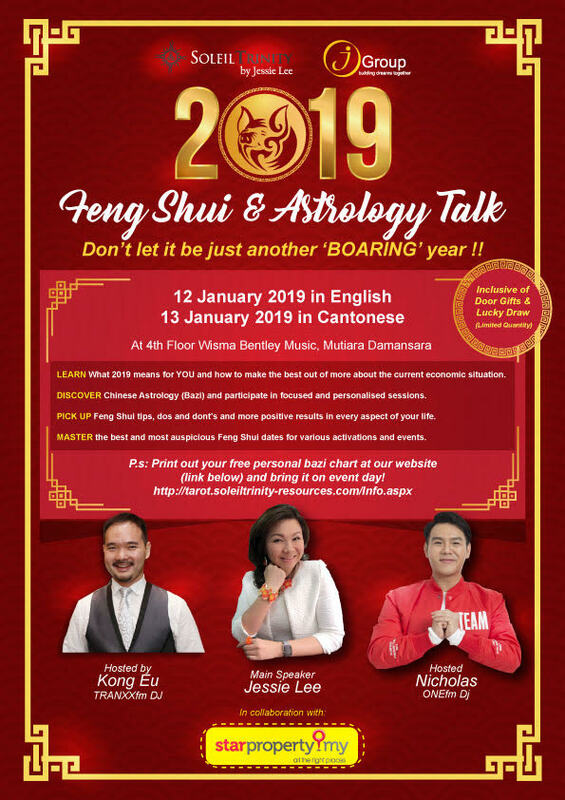 • Identify which are the best and most auspicious Feng Shui dates for various activation suited to YOU including wealth enhancement, health improvement and relationships to ensure you are getting the best out of every situation. All these exclusive lessons, tips, personalized learnings and MORE, to be revealed on 12th (English Session) OR 13th (Cantonese Session) January 2019!!! P.s: Print out your free personal bazi chart at our website (link below) and bring it on event day! Jessie Lee turned a teenage curiosity of the metaphysical into a global empire that serves spiritual guidance and ancient knowledge to corporate entities and affluent individuals around the world. 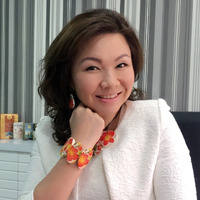 As a professional instructor of Tarot card reading and various branches of Chinese metaphysics, fully trained and certified in the school of thought that is Dato’ Joey Yap’s Mastery Academy, Jessie Lee and her consultancy firm, Soleil Trinity Resource, have been consistently relied upon by celebrities, politicians, and members of royalty, as well as entrepreneurs and brand managers, to provide clarity in the chaotic modern world. Enquiries? Call StarProperty Marketing 03-79671388 (ext 1337) for more details.